There are always early influences that drive and help focus us when we take on any long term endeavour. These influences are pivotal to our development. Some are remembered frequently, some work away at our subconscious quietly, either way they are part of the puzzle that is us. There were many, many (many) books in my formative years in photography. They were my inspiration, my tuition and often my haven. Lofty goals, feeding unrealistic expectations blossomed from these tomes, but don't we all strive for too much to reach enough. Possibly the getting of wisdom is recognising when/what is enough. "StayThis Moment" by Sam Abell was not the first book I purchased, but was the first book that changed my view of how and why I photograph on a fundamental level. Sam Abell once said in an interview "I believe in the staying power of the quieter image". This simple sentence freed me to take my images as they felt right. Early influences pushed and pulled me in many directions, but Sam's comment strengthened my own belief that you don't have to control, simply watch and wait and the image will come as it should. This was a long time ago mind you, so actually doing that was patchy at best, but the seed was sewn. A time when his thinking and the inspiration of his technique resonate strongly with me is in Japan. Even with a long (20 year) gap between the first influences of his work and my own discovery of Japan, his way of seeing and philosophy is often on my mind. It fits very well with both the photographic subject matter and the Japanese way of life. Sam championed strong light, early or late and especially the rare light before a storm breaks. My wife knows what I mean when I say "Sam Abell light". This did not stop him mastering all light. Many of his strongest images are in subdued or poor light. Another practical idea of his that stuck with me was to compose from back to the front. This is a good tip for those why want to do documentary work as the image on a single plane can be literally single dimensional if over used. Allowing the total story to be told in a single image is a special and difficult technique to master. It is worth the effort. The book itself is divided up like a retrospective portfolio, with chapters on Places (Canada, Russia, Japan), specific assignments (The West, Gardens, Shakers) and collections of miscellaneous images under a common umbrella (Canoeing, Faraway Places etc.). Most of the images follow Sam's career with national geographic, with some private, unpublished and earlier ones mixed in. They range from 1970 to the late 1980's. This is not a comprehensive work, but rather a "best of" up to a point in his career of review before change. I followed NG magazine for a few years, looking out for the names I knew, but Sam's work only featured a few times more. He went on to be a picture editor for the magazine and I think taught and lectured. The reproduction was excellent at the time of publishing, true in feel and texture and beautifully bound. It lacks the pictorial "polish" of newer books*, but maybe dodged the bullet of over processing that many older works, recently republished suffer from. He worked with Kodachrome and Leica's, sighting 28mm as his favourite focal length, but using 24-90mm also. Below are some badly copied images from the book. I am not going to try harder for a couple of reasons. The first is out of respect for the work. They are not mine, so they will not be manipulated by me, nor are they ever going to be as good as the sanctioned images in either the book or the internet. They are simply and roughly added as a taster. Assume a richer and deeper palette (and no sheen on the pages). 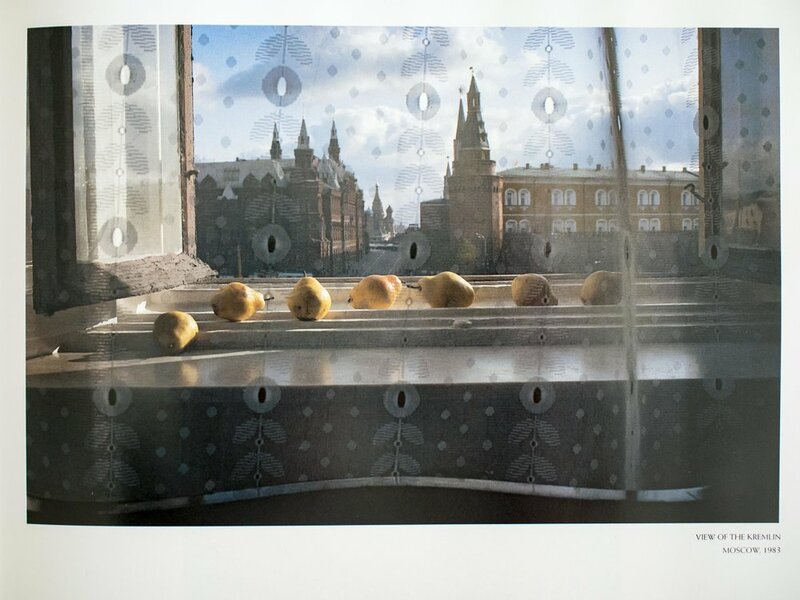 My very first blog post was entitled "Lemons and the Kremlin". The image above (bottom left) was the inspiration for the title. the image of the cowboy branding was used as an example by Abell in a Popular photography interview as an example of "back to front" composition. 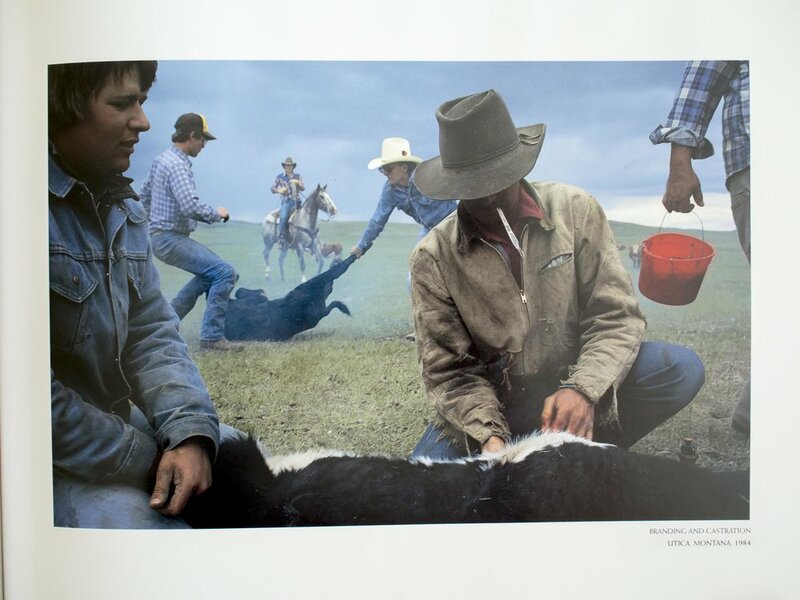 The sitting cowboys are in perfect "Sam Abell" light. These images remind me that brilliant images and inspiring compositions are all around us. Michael Kenna does the same with mono. There is always something to photograph, just look and see. I hope I have learned from him to be gentle, respectful, watchful and clear in my vision. This is not the only book he published, and I have two more, One on gardens and one on the process of image construction, but this is the seminal work of a unique image craftsman in my opinion. *Many of my older, favourite books are near technically perfect in my memory, but fall far short of perfection when viewed years later. I think this false memory haunts a lot of passive film worshippers also.